One-step buttoholes in 29 seconds! So I've been a avoiding buttonholes lately, except when I made Tilly' Picnic Blanket skirt and I free handed the buttonholes on my machine. I was so proud of those little holes! Lovely article - thanks! I had a problem with my Pfaff not understanding (OK, it was me!) when I started a new buttonhole (it is also a 'one step' buttonholer). It was such a pain that I resorted to setting up my Singer Featherweight with an old Singer buttonholer - the one that takes cams - and doing the buttonholes on that. I know have got my Pfaff (OK, so I have learned) to do pretty good buttonholes, but I do prefer the old Singer ones - I can go round the buttonhole twice and the bit of fabric to cut is a little larger than the buttonholes on my Pfaff. But what is even easier than butonholes . . . . invisible zips! They are quick and easy and look great - go on, give them a go!! I love my one step buttonhole too! But I will say, whilst my Janome seems to function the same way as yours, I am not always happy with the size of the hole based on the button in the back of the foot. It generally seems too large. So I'd agree that it's imperative to do a test run and also completely "finish" the buttonhole by cutting open and trying for size. I often have to take out the button and adjust the foot by a few clicks down to get the size I like. How interesting! I've never had that problem personally, but it sounds like you've found a clever way around it! Wow, that is very cool! I don't hate buttonholes most of the time, I just do when there starts to be, like, 12 to do on a garment and the fabric just won't cooperate! My darling ranges dress was a nightmare! Next time I upgrade my sewing machine I'm going to make sure it has this 1-step feature. 1-step all the way baby! My machine has a 4-step buttonhole (SIGH) but at least it has a memory function. I love buttonholes, but I hate to sew them. One of things I'll look for in my next machine will be a 1-step buttonhole function! That surprises me, but well done for not shying away from buttonholes! I' e also got a 4-step and it really is the only thing I would change about my machine! I dream of automatic buttonholes!! Fingers crossed for you one day! I have the exact same machine and it gives me perfect buttonholes pretty much every time. If ever they look a bit dodgy, a quick rethread of the machine sorts it out. I love buttons! But I do like invisible zips too... One thing that confuses me though - I am unclear on which buttonhole option to use when. I've only ever used number 15 (I think). Any ideas? Woohoo! Good stuff isn't it?! I'm also blown away by how fast my go button goes...crazy speed! I share your love for buttonholes (and aversion for zipper)! That's also because my sewing machine makes a 1-step buttonhole (even if I only have the normal one, number 14, the others would be sooo great). The only complaint I have so far is that it doesn't like heavy fabric... So anything wooly needs bound buttonholes. Hmmm, that's a shame...but bound buttonholes are beautiful I guess! 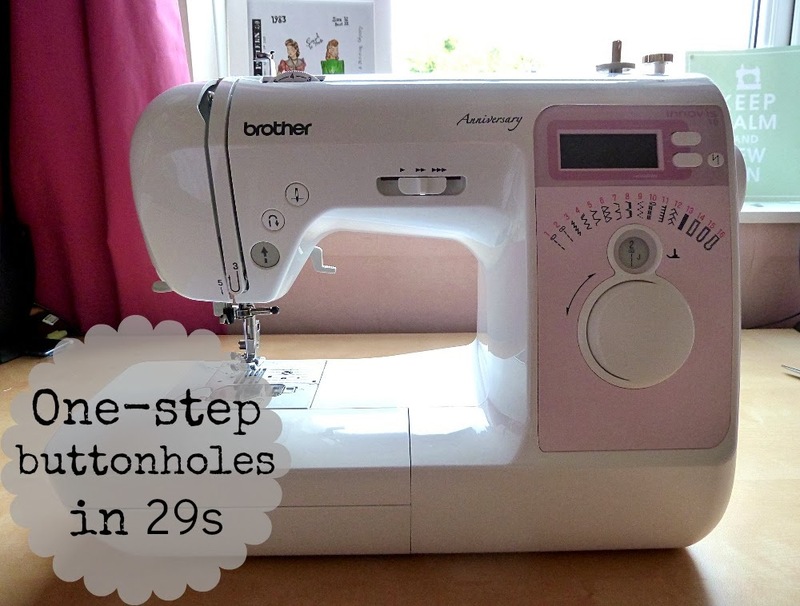 I also have a computerise Brother sewing machine, but my one step button hole function only ever worked once! I have to swap to my machine with a 4 step button hole function when I get to that bit of a make :/ I really have to force myself to do them. Oh no, that's not good! Can you take it to a repair shop or something?! Beautiful! I have a one step, and the buttonholes usually look quite nice when they are stitched, but then I have to cut them open. I haven't found the secret to a clean cut yet, and they end up with threads sticking out, or coming unstitched, or both. Just very rough and ugly. I suppose I should get one of those special chisels - is that what you use? Mine have never come undone (yet), but I know what you mean about the unsightly threads! I've only ever used a seam ripper to open mine up, but I suspect the chisel things are quite good! Must invest in one soon! Very helpful post! I have a brother and a one-step buttonhole maker too. I was always scared of buttonholes because I had the same experience you mentioned--I'd do a test and it would be perfect, then it would all go to hell once I did it on my real garment. finally figured out that I had to raise and then lower my buttonhole guide in between buttons for it to work, just like you suggested. Such a simple little fix, but it can take an age to figure out these quirks! I've had a bit of an aversion to buttonholes and problems sewing them in the past but I tried a couple recently and they were perfect first time so I might be coming round to your way of thinking! I love the buttonhole setting on my machine (it's just like yours) - makes life so much easier! It sure does, high five! Sewing the buttonhole on a test scrap often works out fine for me but the problem is often when sewing it on the garment. The machine often gets stuck sewing near thicker seamed edges. Putting a piece of folded cloth next to the seam helps to keep the foot flat when sewing near this ridge. Oh gosh, never had this problem myself! Sounds like you've found a good solution though! My 525s touch wood is a good one stepper but I do a couple of tests on fabric always. Nothing more horrifying than coming to the end step and it going whack gah! This video was so cool to see - thanks for sharing it with us! It's easy to forget how different everyone's machines are when you're only exposed to your own all the time. I don't have a fancy 1-step buttonhole feature like this, but my 4-step buttonhole works just fine. Once I figured out how to mark my fabric and navigate between the 4 steps, it was a piece of cake! I think hand sewing all the buttons on is much more time consuming, haha. So pleased you liked it! Sounds like you've got your 4-step buttonhole functioned nailed!